Fundraising Games For Clubs - Klubfunder - Helping clubs raise funds. 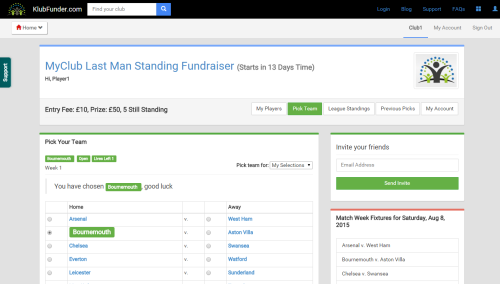 Are you searching for a Last Man Standing spreadsheet to run a fundraiser for your club? If so, they why not check out www.KlubFunder.com where you no longer need to use a spreadsheet to run your competition. You can do it on line and save around 90% administration time as KlubFunder takes care of it all for you. Players can register and play online using their phone, tablet or PC. You can also include players that don’t have access to the internet as you can play on their behalf. Its FREE to use for clubs. No set-up fees and no commission charged by KlubFunder.